The video/audio recording of the presentation that Frances Bell and I gave at the ALTMOOCSIG conference last month has now been posted. Many thanks to Mira Vogel for organizing this event. We were asked very early on (by a Rhizo14 participant) whether our presentation would be recorded – so here is the link. to all the presentations including ours. It has been interesting to listen to this recording. I opened it with some trepidation, as I wasn’t sure how well our presentation went, but on hearing the recording I was pleasantly surprised that it is more coherent than it felt to be at the time, and that in a very short session I think we managed to cover the main points we wanted to make and allow time for questions. We received four questions. All were interesting, but perhaps the one that was most relevant to research about MOOCs at the moment was raised by Marion Waite who asked whether our research was/is ethical. This is a question that we have been discussing with Mariana Funes and Viv Rolfe in relation to researching learning in MOOCs in general, not just the Rhizo14 MOOC. For feedback on the day by various conference participants, see this blog post – responses to the moocs which way now conference . Many thanks again to Mira Vogel for pulling this together. Fred Garnett has also spent some time putting together a Slideshare which summarises the presentations made during the day. Here it is. Thanks to ALTMOOCSIG for a stimulating event which has given us plenty to think about. Rhizo 14: Which way now? 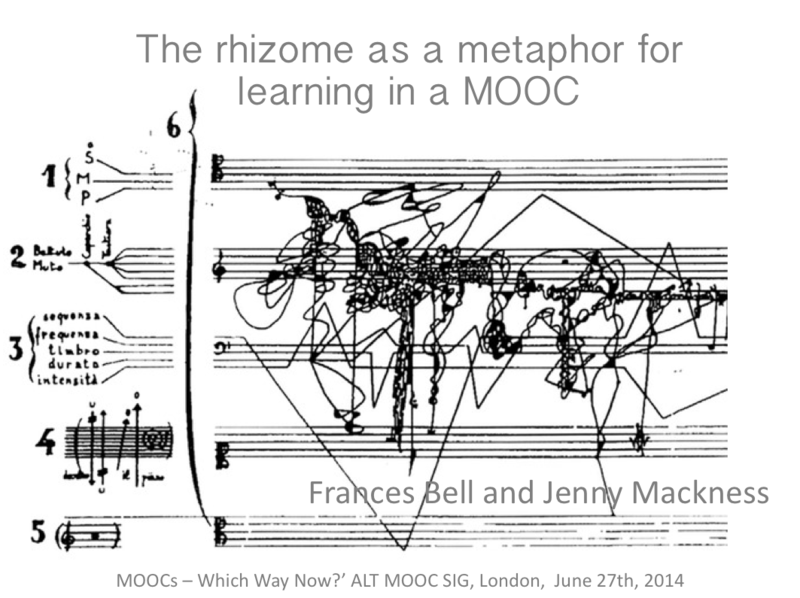 Yesterday Frances Bell and I gave a presentation at the ALTMOOCSIG – The Rhizome as Metaphor for Learning. A Rhizo14 participant, Maha Bali, has asked: How did it go? I haven’t really had a chance to discuss this with Frances yet (we had to rush off at the end of the day to catch our respective trains), but I have mixed feelings. I will start with the positives and then discuss the not so positives. I thoroughly enjoyed the day. More importantly it was very useful for our research. Although we haven’t finished collecting data yet, preparing for a presentation gave us a push to really think through where we are up to. Our decision to write four blog posts about our research before we gave the presentation was, on reflection, both a good and a not so good idea – but more good, than bad. For me the blogging really helped to articulate our current research questions and clarify what we could and could not cover in the presentation. The negative side of this was, for me, that I then had so much in my head that it was difficult to present the ideas associated about rhizomatic learning concisely and with meaning. I think we ‘waffled’ a bit! My long time research collaborator, Roy Williams, was also at the conference. This was great, because having worked together for so long now, I knew he would tell us straight up how he found our presentation – and he did! He said that although he found our presentation thought-provoking and interesting (perhaps he was being kind and that was the sweetener before the pill :-)), he said it wasn’t sharp enough – and he was right. I sensed this even as we were speaking. But interestingly I think Roy and I also have this problem when presenting our work on emergent learning. We just have too much that we want to say and ideas around rhizomatic and emergent learning are not easy to communicate in a traditional form or to an audience who we cannot assume has ever thought of them before. Making a short concise presentation can end up short-changing the ideas being presented, but if it is not concise then people are either not going to listen, or get confused. This is one of the dilemmas. Frances and I hoped that by blogging about our planning for the presentation, we would overcome both these difficulties, but of course we cannot assume that anyone has read the blog posts. Another dilemma is that rhizomatic learning by its very association with rhizomatic thinking and the work of Deleuze and Guattari as expounded in their book A Thousand Plateaus (1980) – resists approaches to hierarchical and arborescent ways of thinking and writing. This was very challenging and despite our best efforts I don’t think we succeeded in communicating what this might mean for education. However, we did think carefully about this and designed our Prezi accordingly but in the presentation itself, I think we failed to communicate the difficulties that we think we are up against. 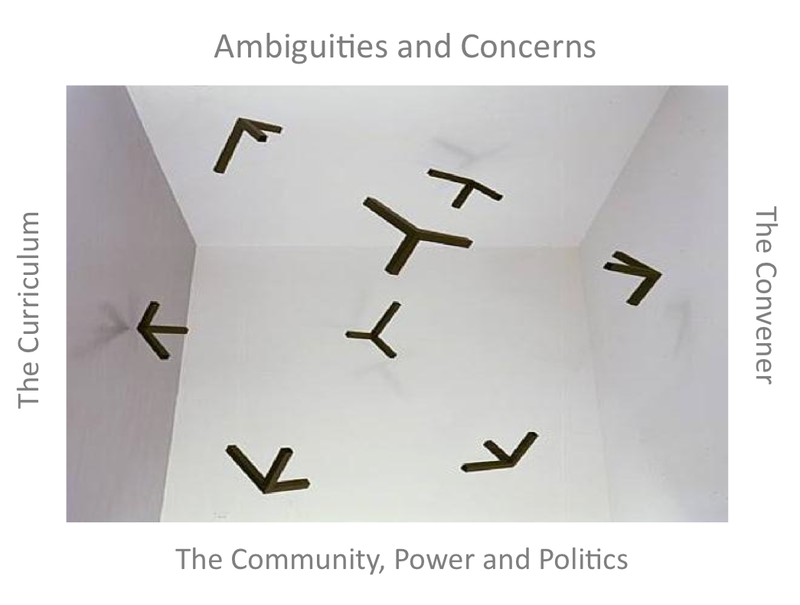 But see the Prezi for the presentation and for an explanation see our four blog posts – Rhizo14: Emerging Ambiguities and Issues. ‘If you have to take a critical stance you have to be on the inside’. And George Roberts has made an interesting post today reporting on a keynote by Marlene Morrison (Oxford Brookes) at a conference he attended today, which focused on countering methodological stagnation. …..Prof Emeritus Marlene Morrison (Oxford Brookes), … gives a radical barnstorming keynote challenge: “Educational administration, ethnography and education research: countering methodological stagnation. Provocative tales from an ethnographer. George’s post maybe of interest to the Rhizo14 group that are engaged in auto ethnography research. It would be easy at this point to say, as a few of our survey respondents have said, that rhizomatic learning and thinking, by it’s very nature is something that cannot be researched. But then how will we ever know that it is worthwhile to think of the rhizome as a metaphor for teaching and learning? It could be, as some of my most valued connections have said, that there is nothing in the idea of rhizomatic learning that makes any sense or is worth spending time on; or it could be that the metaphor has some uses, but is incomplete, as some of our survey repsonses have said; or it could be that Deleuze and Guattari’s ideas about rhizomatic thinking really will help us to make a paradigm shift in teaching and learning. Frances, Mariana and I haven’t got far enough in our data analysis to make any comments about this as yet. BUT, my collaborator Roy Williams, said of our presentation – ‘There was at least one elephant in the room’. I would say there were three – community, curriculum and convener – but although all these three seem to be significant for us in our research, we haven’t yet finished our data collection and we haven’t yet completed our data analysis. So they will have to remain as elephants in the room, until we have something sensible to say that can be backed up by evidence. So Rhizo14 – which way now? For me we need to decide whether this is worth pursuing or not, and if so why? ALTMOOCSIG Conference: MOOCs – Which way now? MOOCs – Which way now? This was the question for the ALTMOOCSIG day conference (Friday June 27th) which was hosted at UCL. As an independent consultant and researcher, I have to think carefully about where to invest my time and resources. This was a free conference (thank you ALT, Mira Vogel and Fiona Harvey), but of course there were expenses involved with travelling from Cumbria to London – but it was well worth it. All the sessions I attended were interesting and thought provoking and there was a very good atmosphere – relaxed and friendly, but intent on discussing the issues. For an excellent post about some of the sessions see George Robert’s blog – Open online courses: ALT MOOC SIG. Two sessions that I attended that George did not, were Ronald MacIntyre’s Workshop – ‘Open Education and the Promises we make’– and Matt Jenner’s session ‘MOOCs: it’s not about the money’. 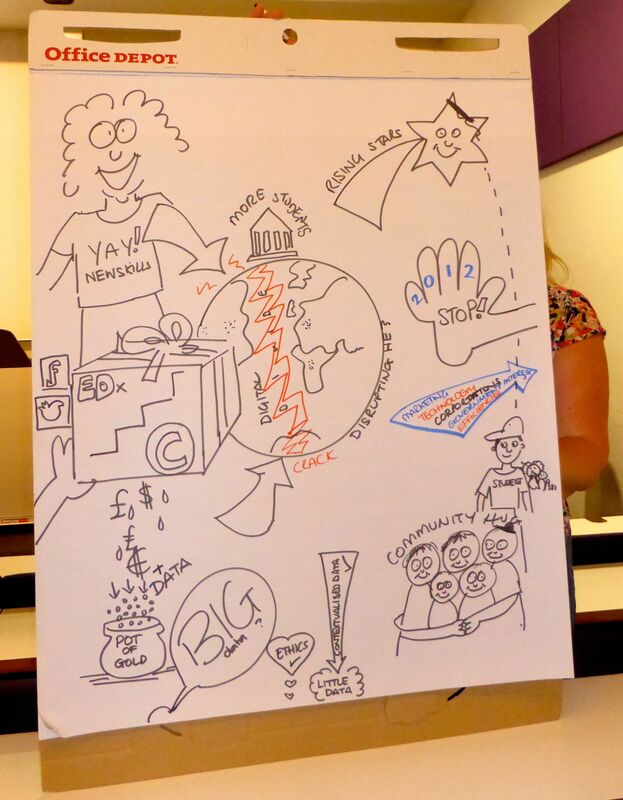 In Ron’s workshop, our group had a lot of fun drawing what we thought about the promises we make in open education – or rather the wonderful Fiona Harvey did the drawing. These comments although reported out of context here, seemed to resonate with some of the thinking Frances Bell and I have been doing for our own presentation on rhizomatic learning (see Rhizo14: Emerging Ambiguities and Issues for further information). Aidan Johnston’s presentation – Storytelling through MOOCs. The story in question was told in the context of the University of Strathclyde’s Introduction to Forensic Science MOOC, which attracted thousands of participants, who attempted to solve a murder case. These presentations showed very good use of technology for creating and running a successful MOOC, but it must have been at some cost, particularly if, for whatever reason, the MOOC cannot be run again, e.g. presumably Strathclyde’s MOOC built around the story of a murder can’t be used again if the object was to solve the murder. The other session I attended that George has not reported on, was at the end of the day when Matt Jenner got us to think about the benefits of MOOCs and asked us to use voting response systems to share our opinions, which was a very good way of covering a lot of ground quickly and having a lot of fun at the same time. See Matt’s blog for details – What’s the benefit of MOOCs? Diana Laurillard. ‘If you have to take a critical stance, you have to be on the inside.’ – an interesting perspective for researchers. Fred Garnett. ‘We need new metaphors for learning.’ ‘If you try and bring a community together, you create a hierarchy’. Alexander Griffin. ‘A good building is one that relates to its context. We have to understand our own context’. ‘Learning [is good] when you don’t know it. Teaching when you don’t know it is even better.’ i.e. don’t know that it is happening. How much further forward were we at the end of the day in answering the question – MOOCs – which way now? Its no longer a question of whether it can be done; institutions with the resources can design and run MOOCs which will be enjoyed by participants. MOOC conveners can learn from each other and the technology is available. Cost clearly continues to be an issue – in terms of time and money, even though Matt Jenner tried to focus on the benefits of MOOCs, saying it’s not about the money. Shirley Williams from Reading University talked about paying undergraduate and postgraduate students to support MOOCs, others talked about the cost of producing videos etc. and then there is the cost of the tutor’s time, especially if running a MOOC is additional to a tutor’s normal workload. Is this sustainable? It seemed to me that people are beginning to wonder what it is all for – not what are the benefits, but who benefits. I am always struck by how rarely the early MOOCs, such as CCK08 are referenced in this respect or at these events. What came through very clearly for me in CCK08 was an intention to think differently about pedagogy, and the necessity to think about how teaching and learning can be aligned with the needs of living in a digital age. Focussing on this still might help to answer the question – MOOCs – which way now? 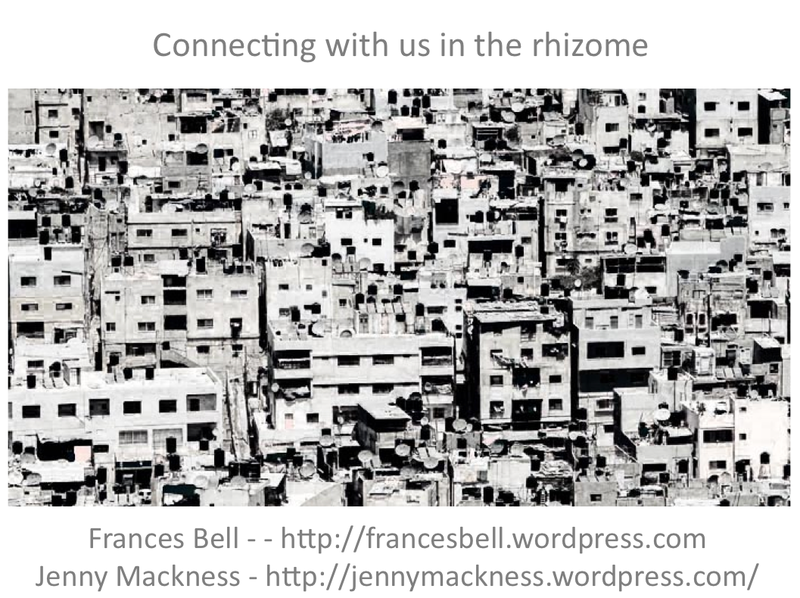 This is the fourth and final post in a series which outlines the thinking and planning Frances Bell and Jenny Mackness have been doing in preparation for our presentation – The Rhizome as a Metaphor for Teaching and Learning in a MOOC – for the ALTMOOCSIG conference on Friday 27th June. This final post will cover some of the issues that are emerging from our research data. The rhizome is a useful metaphor for learning but it does not add anything significantly new to our current understanding of teaching and learning. The use of the rhizome as a metaphor for designing teaching and learning has a positive impact on the role of the teacher. The rhizome metaphor is sufficient to describe networked learning, but insufficient to describe learning in a community. The rhizome is an adequate but incomplete metaphor for explaining how we learn. The metaphor of the rhizome works well for social learning, but less well for knowledge creation. The statements exemplify some of the emerging alternative perspectives on the learner experience of the Rhizo14 MOOC. We haven’t done enough analysis of our data yet to come to any conclusions, but here are some tentative initial questions, findings and discussion. We do not have any answers to these questions. We simply raise them and open them for discussion. The role of the convenor. What is the role of the convener in a course which tries to apply D &G’s rhizomatic principles? Is it possible to have no centre? Here are the alternative perspectives of two survey respondents. Our words, our images, our diagrams were what drove the learning for ourselves and for others in the course. Where the conversations went did not start from a single centre and move in an ordered fashion from there; they started wherever we started, and moved wherever those involved wanted them to move. As a result, there were numerous conversations happening at the same time, going in different directions, linking up to others if we made the links happen. Is a course, which necessarily means there is a course convener, the right environment for exploring and modelling rhizomatic learning? D & G talk about smooth and striated space. Striated space is structured and organised and can be the home of ‘state thought’, whereas in smooth space there are no fixed points or boundaries. Many of Rhizo14’s provocative prompts seemed to be designed to help participants challenge state thought/ arborescence in education. We are curious to explore how nomadic thought was enabled and constrained by the few structuring devices (activities and technologies) present in Rhizo14. Although rhizomatic nomadic thought may seem more at home in smooth space, it may not have that luxury. There may have been more striated space in Rhizo14 than you would expect in a course about rhizomatic learning. This also relates to thinking about the rhizome as achieving ‘felt-like’ status, which Holland (2013) equates to ‘smooth space’. Holland writes (p.38) that ‘any rhizomatic element has the potential to connect with any other element’ . He compares felt to the warp and woof (weft) of fabric. Early analysis suggests that Rhizo14 didn’t achieve felt-like status (i.e. a smooth space). There was not enough ‘omni-directionality’. The potential ambiguity between Dave Cormier’s role as convenor (with his expressed desire to moderate communication) and his wish to be de-centred within Rhizo14 may have been realised in confusion and challenge by some participants, and defence of him by others. There is some evidence of this in the data we collected. A possible explanation could be that Rhizo14 ended up being ‘over-coded’ with Dave Cormier as the signifier and members of the dominant Facebook Group as signifiers, thus working against decentring. This is the one of the issues we hope to explore with Dave Cormier himself to enrich our understanding. The Community: Is the idea of community compatible with D & G’s principles of rhizomatic thinking? In Rhizo14 is the community an example of territorialisation? D & G write about the necessity of territorialisation, but say it should only be relatively temporary. There is no mother tongue, only a power takeover by a dominant language within a political multiplicity. The question we, as researchers, are considering is whether the notion of community works against rhizomatic thinking principles, but we haven’t got any further than this at the moment. Does a community lead to a standard language and a power take-over? One interesting aspect of community within Rhizo14 is that although Dave Cormier drew on his existing network to attract participants to the MOOC, there was no pre-existing Rhizo14 community, and so part of the early ‘work’ of Rhizo14 was community formation. This is an interesting issue that we hope to explore further. This begs the question – what was the curriculum? As is evident from the first quote from a survey respondent under point 1 above, there were some participants who believed that the curriculum was created by the community. We have evidence that participants learned ‘how to MOOC’, ‘how to make connections with like-minded people’, and ‘how to think differently about their existing educational philosophy’, but as mentioned in a previous blog post, only a handful survey respondents referred to D&G’s work in their understanding of the rhizome as a metaphor for learning and teaching. As well as minimising the content he provided, Dave had already affirmed the need for learners to create content. Participants from DS106, EDCMOOC, and CLMOOC 2013 would already have experienced a MOOC where ‘making’ was a key focus for community/ course participation. The ‘Arts and Crafts tent’ was popular, a participant-driven approach, and can be seen in the many multimedia artefacts tagged #rhizo14, but not everyone wanted to do this. One of the ways in which curriculum could be perceived is by the content generated by learners, and the diversity of content from poems to wordy blog posts and a lot of remixes in multimedia in Rhizo14. I do not quite understand how the community designs and negotiates its own curriculum community. We need more studies and references to describe the processes of negotiation that go on within a community that enable it to design their own curriculum. I have a feeling that this metaphor needs to be connected more to pedagogical issues arising from educational research. 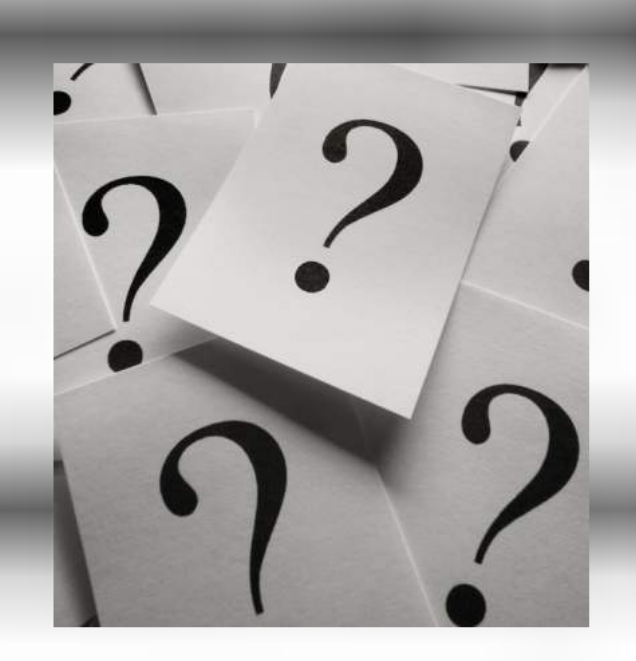 Which neatly brings us to the end of our presentation and emphasises that we still have more questions than answers and, as we have mentioned before, far more thoughts and discussion topics than we have room for here, or time for in our presentation. Deleuze, G. & Guattari, F. (1987). A Thousand Plateaus, University of Minnesota Press. This Creative Commons License applies to this blog post and supercedes the one that normally applies to this blog, which can be found in the sidebar.In publishing interim findings to our blogs, we are cautious about how we publish what could ultimately be part of a journal article. For this reason, the license under which we publish these posts relating to our presentation is different from the one normally applied to our blogs. This is the third in a series of posts which outline the thinking and planning Frances Bell and Jenny Mackness have been doing in preparation for their presentation – The Rhizome as a Metaphor for Teaching and Learning in a MOOC – for the ALTMOOCSIG conference on Friday 27th June. Deleuze and Guattari (D & G) enumerate 6 approximate characteristics of the rhizome. There are others that are also relevant to rhizomatic learning and teaching and may even be more relevant, such as ‘nomadic thought’; ‘wolves, tribes and packs’; ‘smooth and striated space’; ‘assemblages’; ‘territorialisation’; and ‘lines of flight’ – which we are still unpicking in relation to our data, but don’t have time to discuss here. So for now we’ll stick with the six principle characteristics, which are on the image above and listed below. In Week 2 of Rhizo14 a discussion arose in the Facebook Group around some participants’ perception that they were expected to study theory, and that some other participants’ posts were condescending. This has subsequently been labelled within #Rhizo14 as a theorists versus pragmatists divide. There was an attempt at self-healing by Rhizo14 participants but apparently the outcome was not satisfactory to those most affected and some people left the course as a result. Leaving a MOOC need not be seen as some sort of failure if you have drunk enough from the well, but leaving from a sense of alienation would be more troubling. Subsequently, ‘pragmatism’ achieved a kind of ascendance in #Rhizo14 and Deleuze and Guattari’s ideas about rhizomatic thinking were discussed less and less during Rhizo14. Recently in the Facebook group there has been a discussion about whether or not the group should now discuss Deleuze and Guattari’s ideas – but the discussion was fairly quickly passed over. A key contributor to Rhizo14, Keith Hamon, had already published a treasure trove of posts on D & G’s rhizomatic thinking and continued to apply their theory and that of others during the MOOC. There are D & G principles that can be considered in relation to learning in open learning environments and were in evidence in Rhizo14. We do not claim to be philosophers. Neither can we claim to have read or understood all of D & G’s work, but we are finding evidence of some tentative links between D & G’s ‘approximate characteristics of the rhizome’ and learning in Rhizo14. 1. Connections – a rhizome ceaselessly establishes connections. There is evidence of this in Rhizo14 – plenty of connections were made and are still being made, but some survey responses have revealed that this was not the case for everyone. Some people felt excluded or peripheral to what was going on in the course. A feature of Rhizo14 was the core group that gathered in Facebook (originally set up by Dave Cormier) and though a wider range of participants contributed less frequently, the core group persisted and now refer to themselves as ‘die-hard rhizo14ers’. As the contributions to P2PU, the G+ group and blog posts began to tail off in Weeks 4-6, the Facebook group became the main focus of activity on Rhizo14. When the course ended this is largely where discussion continues, although the core group posted topics on P2PU for Weeks 7-12, after the ‘official’ end of the course. A rhizome has multiple points of entry. One of the most active participants didn’t join until Week 4, and new people still appear in the Facebook group and post to Twitter with the #rhizo14 hashtag. A rhizome also has no beginning and no end and we have evidence that the Rhizo14 course is an example of this. I stayed because of the community – it was great fun. It gave me space to reflect on D&G, collaborative learning, and learning communities and to talk to other like-minded people. 2. Heterogeneity – any point of a rhizome can be connected to any other and must be. In relation to Rhizo14 was this characteristic of a rhizome in evidence? – yes and no. Ultimately there has been a discussion about whether Rhizo14 ended up being a clique and how heterogeneous is the Rhizo14 rhizome; there seems to be a tension between ‘community’ and the principles of a rhizome in D & G terms. This is something we need to explore further. 3. Multiplicity – A multiplicity is, in the most basic sense, a complex structure that does not reference a prior unity. There was diversity in Rhizo14 – but was there multiplicity – which requires no central pivot point – being a-centred and de-subjectified? There are no pre-determined positions or points within a rhizomatic multiplicity, only lines along with random nodes arising at the haphazard intersections of them (felt). Now, clearly, Dave Cormier was at the centre in the sense of organizing the course and providing intro videos, but the vast majority of the actual course content and activities was made up of what we, the participants did. From a technological perspective one could perceive the variety of platforms as ‘multiple’: participants could engage at P2PU, G+, in the Facebook group, posting on their blogs, commenting on others’ blog posts, conversing via the Twitter hashtag, expressing ideas through Zeega. Where the interlinking between these spaces was simple and bi-directional, such as posting a link to an open blog, youtube video or another open web resource this seemed to be like multiplicity in the rhizomatic sense. Where the interlinking was more inward looking, such as commenting on a Facebook post about a blog post or a link that was not truly open, like a link to a Facebook or G+ group/ community thread, then some of the ‘felt-like’ qualities of the rhizome were lost, and the multiplicity seemed more apparent than real. Asignifying rupture. If you break a rhizome it can start growing again on its old line or on a new line. Connections are constantly breaking (deterritorialisation) and reforming (reterritorialisation). It’s difficult to get evidence for this because once people have taken a line of flight it’s hard to find them or find their new rhizomatic connections. This is an issue in our research – despite our best efforts to reach early leavers, we know that some important voices are missing from our research. However territorialisation in the form of the Facebook group was dominant in the course – but those who took a line of flight will have taken something with them, although as D & G point out a line of flight can become ineffectual and lead to regressive transformations and rigid segments. There were also lines of flight within the Rhizo14 course. Participants were looking for lines of flight from traditional ways of thinking and working – taking their classes out onto the Internet, away from canonical texts, valorising cheating, etc. One can also identify people whose lines of flight brought them into Rhizo14, for example Dave Cormier and a few participants who had already applied rhizomatic thinking to teaching and learning contexts. 5 & 6. 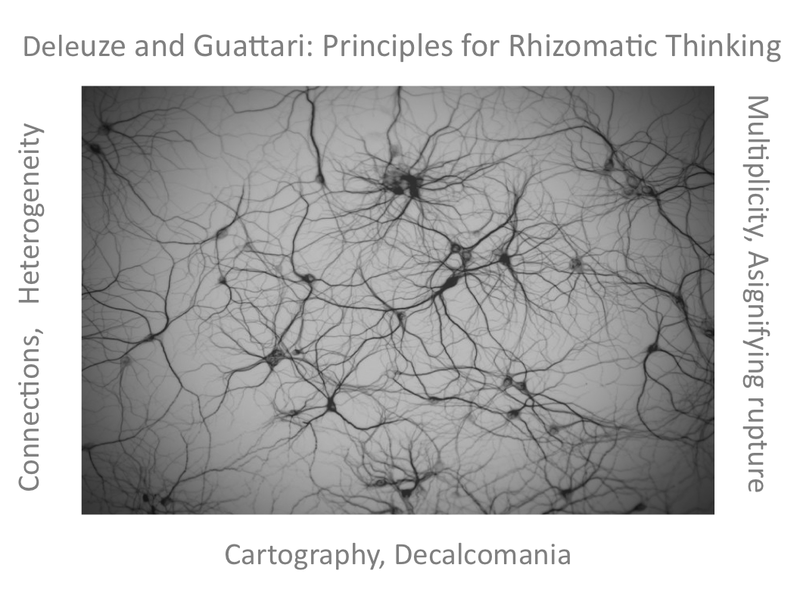 Cartography and decalcomania – the rhizome is like a map and not a tracing. You can enter a rhizome at any point. Maps are always unfinished and subject to revision – so in this sense Rhizo14 was a map rather than a tracing. The discussion around Rhizo14 continues – albeit in one space – and new members are joining. These are our first tentative thoughts about how the Rhizo14 course and our investigation of learner experience within it might or might not be informed by Deleuze and Guattari’s six approximate characteristics of the rhizome. There is still a lot more to explore and understand in relation to this and we are a long way off coming to any conclusions, if indeed that is possible or there are any. This Creative Commons License applies to this blog post and supercedes the one that normally applies to this blog, which can be found in the sidebar. In publishing interim findings to our blogs, we are cautious about how we publish what could ultimately be part of a journal article. For this reason, the license under which we publish these posts relating to our presentation is different from the one normally applied to our blogs. This is the second post in a series of four about a presentation Frances Bell and Jenny Mackness will make at the ALTMOOCSIG on Friday 29th June this week. One of the reasons for these posts is that it is going to be impossible to cover all this in the time we have available at the conference. In this post we outline how we will continue our presentation, by sharing what we understand by the rhizome metaphor, a description of the #Rhizo14 course, and an explanation of how we are conducting our research. The rhizome in botanical terms is an underground stem, which grows horizontally along or more commonly under the ground and sends out roots and shoots. Examples of rhizomes that Jenny has in her garden are mint and ground elder – so good and bad! If you have ever tried to dig up a rhizome, you will know that it is virtually impossible to know where it started from and that if you break a root in the process, the plant is likely to spring up again somewhere else. Many Rhizo14 participants valued the metaphor of the rhizome for teaching and learning. Quoting from survey responses, participants of the Rhizo14 course thought that teaching and learning based on this metaphor is ‘subconscious’, ‘subterranean’, ‘subversive’, ‘a non-linear, multi-directional underground web of connections’. Learning is ‘haphazard’, ‘messy’, ‘serendipitous’, ‘esoteric’, ‘dynamic’, ‘unbounded’, ‘unpredictable’, ‘adaptive’, ‘self-organising’ and ‘non-hierarchical’. This is what these survey respondents valued about it. ‘A pernicious, pervasive weed, rooted in a lot of dirt and ‘SH***”’; ‘….a ‘thug’ and can be very badly behaved’; ‘Part of one big family/plant – joined at the hip’. ‘Clones of the ‘same damn plant’. These quotes illustrate the most common interpretations of the metaphor in response to the survey questions. Only 4 (out of 47) respondents referred to Deleuze and Guattari’s work when explaining their understanding of the rhizome as a metaphor for teaching and learning. It was possible to recognise the principles of the original cMOOCs (e.g. CCK08) in the design of #Rhizo14 – principles of working across distributed platforms (e.g. P2PU, Facebook, Twitter, Google +), learner autonomy, diversity, openness and interaction. There was also the understanding that the activities would be those of a CCK08 type of cMOOC – aggregation, remixing, repurposing and feeding forward, and these activities were in abundance. The other key similarity was that it was an open and free course. 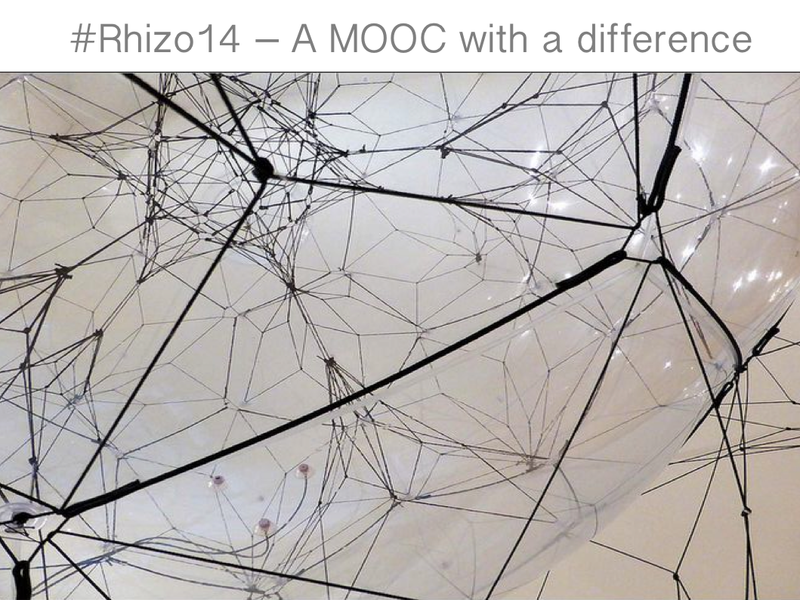 – How was #Rhizo 14 different to other cMOOCs? The gap between novices and experts seemed very vast, and scaffolding seemed difficult with these extremes. At the same time, the approach to topics seemed to be a bit unworthy of the in-depth knowledge of “veteran” cMOOCers, and an increasing frustration with this seemed to creep into the blogs. For Dave Cormier, the key difference was that he was attempting to run a course with no content. Each week there was a very short introductory video (av. 3 mins in length) which introduced an opening provocative question, e.g. Cheating as Learning (Week 1), Is Books Making us Stupid? (Week 4) – and that was it. Unlike CCK08 there were no recommended readings. Rhizo14 was also different in that it was literally ‘home-grown’, with Dave Cormier running the MOOC in his own time, often from his own home and convening weekly Hangouts in the evening, sometimes whilst trying to get his children to bed. Despite this, his intention was that there would be no centre to the course – the course convener would be one of the participants. Another clear difference in this MOOC is the very active Facebook group which continues to discuss rhizomatic learning and related topics after the course has ended. This group thinks of itself as a community and believes that the community is the curriculum. The significant aspect for me was finding others that were willing and able to play freely, have fun and then be reflective and metacognitive of the activities. I enjoyed the banter, tease, create, steal, mix, mash, present, prod, challenge, rework, share, admire, learn, dive deep, surface often, spiral-on action of our poetry building, reflecting and sharing. However, this was not the experience of all respondents and some were not so positive and questioned whether there was or was not a centre to the course, and whether the course should or should not have had more ‘content’. For example one respondent thought of the course in terms of concentric circles with Dave Cormier at the centre and a core group around him. There has also been a recent discussion in Facebook about whether Rhizo14 resulted in a clique gathered around Dave Cormier. I’m quite pleased that Cormier was able to step back, for the most part, and allow the rhizome to work. At best it [rhizomatic learning] might let academia realise that learning isnt about content, but reflection, discussion and creativity. Whereas another respondent seemed to suggest that more content and leadership might have been helpful. The point has been the connections formed, the conversations generated. The problem perhaps would be for those not already confident in their own academic capital. Who may not feel they have much to offer – or who may feel that they need more guidance through content – or who may feel that they are continually missing that important blog post… who may want to have some sort of over view from which to diverge or to which they can add the contingent. It could also be difficult for those who do not feel central to the conversational groups that sprout(ed). If connectivity and conversation becomes the point – who are you if you do not feel that you have not connected in that way? There are many more comments like these in our data which exemplify the diversity of opinion on all aspects of the course – and indeed whether this was a course at all. In MOOC research, given the number of people who either drop out or are ‘silent’ participants, it is difficult to judge the accuracy of the balance between positive and negative responses to survey questions, but for this research survey responses were both positive and negative in respect of most of the emerging themes, with there being more positive than negative responses. – How have we carried out the research to date? We participated in the MOOC as fully engaged participants and have collated resources from the MOOC on a private wiki. These resources include Facebook threads, Twitter streams, annotated readings, discussion, survey results, links to videos and our own participant observation/reflection. How does the image of a rhizome relate to your prior experience of teaching, learning? 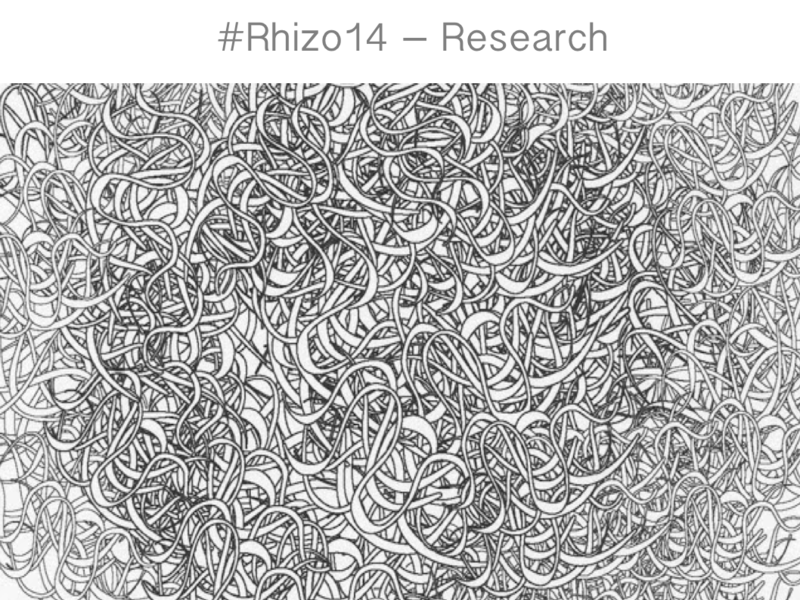 How does the image of a rhizome relate to your experience of learning during Rhizo14? How might the image of a rhizome represent your future practice? If the above questions did not allow you to fully explain your learning experience in Rhizo14, then please comment in the box below on those aspects of the course which were significant for you, and what kept you in the course or caused you to leave early. We posted the link to the survey on Facebook, in the Google + group, on our blogs and on Twitter. The link was also sent to all P2PU participants by Dave Cormier. In an attempt to ensure that we reached as many participants as possible, not only those who were still active at the end of the course, we identified non-registered participants and bloggers and sent them individual invitations to respond to the survey. Most importantly, the survey allowed for anonymous responses. It is difficult to know exactly how many people the survey reached, but we received 47 responses and more than 30,000 words of data. Within the last month we have sent out further questions by email to 35 survey respondents who agreed to receive these follow up questions. Finally there has been the issue of what is an appropriate method and methodology for this type of research and this subject. Will it be impossible to get at what we mean by rhizomatic thinking and learning by using traditional research methods? Some respondents have already raised this issue in response to the email interview questions. I don’t want to further “territorialize” the experience [by engaging in research], preferring instead to keep it open, unformalized, and unanalyzed to some extent. Hopefully this post provides a taste of where we are up to with our research and what our presentation for the ALTMOOCSIG will try to cover, albeit very briefly, but we are not done yet. There will be two more blog posts. The title of the presentation is The Rhizome as a Metaphor for Learning in a MOOC. We decided to submit a proposal for presenting at the conference as a result of participating in Dave Cormier’s 6 week MOOC – Rhizomatic Learning: The Community is the Curriculum (known now as #Rhizo14), which started on January 14th this year. During the course, our interest was piqued by comparison of our experience on #Rhizo14 with that on other MOOCs. We decided, together with Mariana Funes, to conduct independent research on the #Rhizo14 experience. The aim of our presentation for the ALTMOOCSIG – is to share our experience of the MOOC, where we are up to with our research and our initial findings. It has been difficult to plan both the research and this presentation. Basically we are ‘wallowing in data’, we have too much to say for a short presentation, and what we have to say now will not be the same as when we have engaged further with the data. In addition, as some survey participants have pointed out, there are contradictions, not only in running a MOOC on rhizomatic learning (the rhizome as a metaphor isn’t easily ‘pinned down’ in this way), but also, for similar reasons, in conducting research into rhizomatic learning. So we have given some thought as to how to do a presentation which reflects these difficulties. After some mutual discussion and discussion with a survey respondent, we decided on using Prezi. A power point seemed too linear and structured for reasons which hopefully will become clear in our presentation. A Prezi seemed to reflect, at least in part, the chaotic environment and ‘falling down a rabbit hole’ aspect of rhizomatic learning that was discussed in the course. However the linear path that we will take through the Prezi is not the only possibility – theoretically there are many possible (but not all likely) paths through the Prezi. We also want, in our presentation, to reflect some of the principles of a rhizome. This is virtually impossible to do in a structured conference programme within a time limit – but we have given a nod to this by selecting images for the presentation which depict the ‘tangled mess’ that was the #Rhizo14 experience and the fact that the intention was to create a course with no content. More of this later, but our Prezi has virtually no content. That doesn’t mean to say that the presentation has no content – and therein lies the conundrum – more of this later too! We only have 25 minutes, so hopefully these posts will help to ‘fill out’ the presentation. We intend to talk for about 12 minutes to allow time for comments, questions and discussion, but this will only allow for a brief introduction to our research. The first image on our Prezi is the one which starts Deleuze and Guattari’s seminal text ‘A Thousand Plateaus’ from which all the ideas about rhizomatic thinking have emanated. Gilles Deleuze was a French philosopher and Felix Guattari a French psychiatrist and political activist. The concept of the rhizome as a metaphor for thinking (note ‘thinking’ – not ‘learning or teaching’) was developed in their book ‘A Thousand Plateaus’, which they published in 1980. This book was intended as an experiment in schizophrenic and nomadic thought, but has captured the attention of some educators, who see the rhizome as a useful metaphor for understanding learning in open environments such as MOOCs. The image is of a musical score created by Sylvano Bussoti for a composition entitled Five Pieces for Piano for David Tudor. Bussoti was not only a composer but also an artist – his scores are more like works of art – and he was deeply opposed to all rigid systems of composition. Deleuze and Guattari in the same way were opposed to an arborescent conception of knowledge. They suggest the rhizome, which resists organisational structure, as a metaphor for thinking. We then move on, in our presentation to discussing what we are trying to find out. 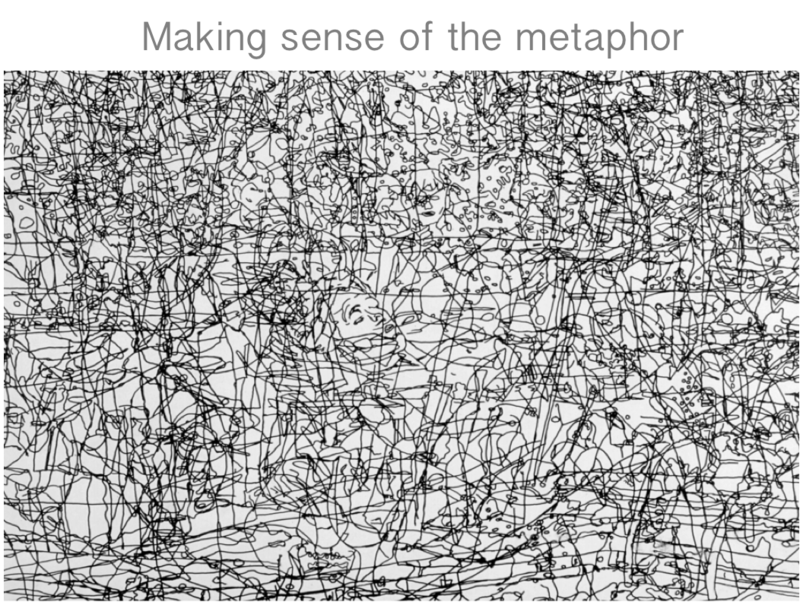 Is this metaphor useful for learning and teaching? If this metaphor is used for designing a MOOC (rhizo14), can people learn and what do they learn? To what extent is the rhizome a persistent metaphor for what #rhizo14 becomes? Traditional scientific research (hypothetico-deductive) would have expected us to start our research with these questions – but since the rhizome doesn’t work like that, neither has our research. These questions emerged as a result of our experience in #Rhizo14 and our ongoing research. Although they bear a relation to questions we asked the participants, they are also influenced by the survey results we have received. These are neither the first questions we have raised nor will they be the last, and our answers may also be provisional. At the point at which we are giving the presentation – these are the questions – but we fully expect that they might change. So this is how we will start our presentation. This is the content that is absent from the Prezi, that we have deliberately chosen not to reify within the Prezi – and which even publishing here succumbs to a structure and territorialisation that Deleuze and Guattari say should only be temporary. We should always be ready for ‘lines of flight’. So here’s a health warning with this presentation. This is how we are thinking this week/today. There is no guarantee that is what we will be thinking next week/tomorrow. In our next blog post we will explain the next few slides/Prezi screens of our presentation.